Add a Recent Posts List after Every Post. ~ The Blog Doctor. You are here: Home > RSS > Add a Recent Posts List after Every Post. Add a Recent Posts List after Every Post. To put a Recent Posts List in the sidebar see List Previous Posts. Substitute actual name of your blog instead of 'yourblogname' above. Type or paste your RSS blog feed url in the text box provided. See picture below. Click on image to enlarge it. 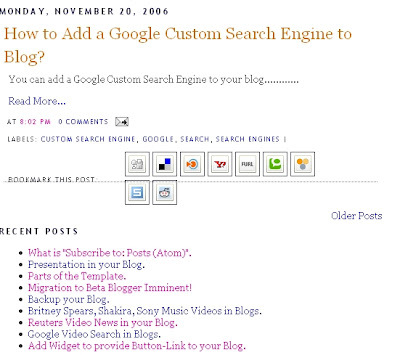 Login to your dashboard of Beta Blogger and click on Layouts of the blog whose feed you had taken in the first step. The Page Elements window opens. Click on Edit Html tab and first backup your template as described in How to change Template. Then Save Template. This change will enable you to add extra Page Elements/Widgets to the main column. hi, i followed the steps but for some reason it works sometimes and sometimes doesn't work properly.. Thanks for such a nice tutorial.. But can u please guide me to add a widget showing Related Post below every blog post but not on the homepage. I would be glad to get that help.. Wonderful tutorials you have. I've updated my blogs using it. Looks and feels just the way I want it to be now. I tried configuring this "Add a Recent Posts List after Every Post" but unfortunately I can only show a maximum of 5 posts. How do I change this to reflect, let's say, 7 days worth of posts?